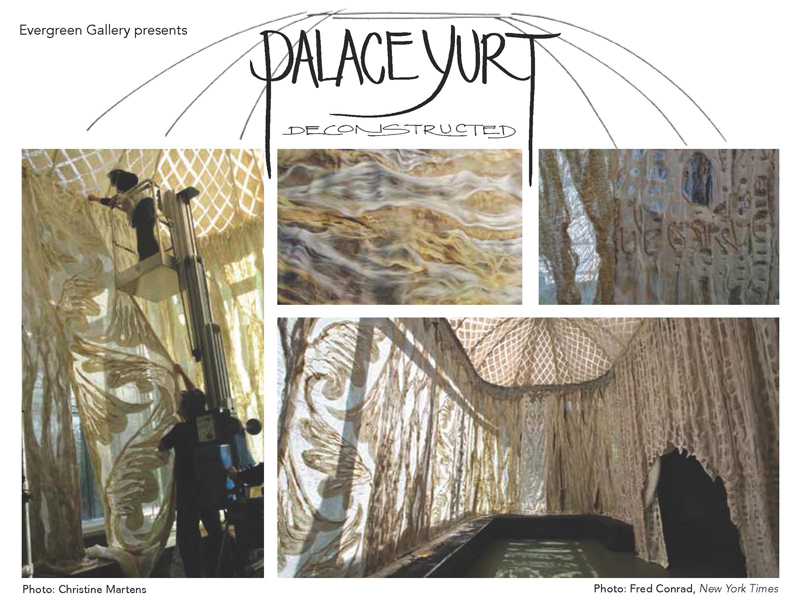 WA SDA member, Janice Arnold, is installing her exhibit “Palace Yurt: Deconstructed” on the Evergreen campus. Palace Yurt was a site specific installation at the Smithsonian Cooper-Hewitt National Design Museum in New York City and featured in the NY Times Arts section. A contemporary translation of traditional Mongolian structures, Palace Yurt was the centerpiece of the museum’s 2009 Fashioning Felt exhibition. Janice, an Evergreen alumna, is re-installing the exhibition in the TESC gallery on the Evergreen State College campus. The exhibition gives visitors a rare look behind the scenes of this groundbreaking work of textile art, including many pieces from the original installation. See how it all came together, from inspiration to logistics and technical drawings, the raw materials to the full artistic vision. The SDA South Sound meeting on October 22 will feature a talk by Janice describing the making of this installation, as well as a tour. All SDA members are welcome to join in this opportunity, starting at 12 noon at the Evergreen Gallery. The exhibition opens Oct 10 and runs thru Dec 11, 2013 with an Opening reception Oct 10th from 5-7pm. The Evergreen Gallery is located in the Evergreen State College Library building, main entry level, room 2204. Janice will also be giving a lecture at Evergreen on November 20, 2013 from 11:30 am – 1 pm at Lecture Hall 1, as part of the Everngreen State College Art Lecture Series. This entry was posted in Exhibition, Member Event and tagged Exhibition, Felting, Installation art, Janice Arnold.